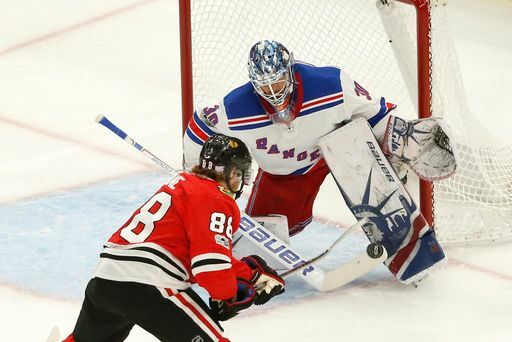 The Rangers are welcoming Chicago to New York tonight in a battle for lottery positioning. The Hawks are at 41 points (16 ROW) in 48 GP, and the Rangers are at 45 points (14 ROW) in 46 GP. In theory, a Hawks win in regulation gives the Rangers hope they can pass them in points by the end of the season. That’s just the fan view of things, though. The players aren’t going to tank. Mats Zuccarello is on a tear right now, padding that trade value. Chris Kreider is on his way to 30 goals. Kevin Hayes is still out, though. Those three could bring back hauls at the deadline, if all three are dealt. It would be nice to see repeat performances from Pavel Buchnevich and Tony DeAngelo, as well. Collin Della gets the start. Crazy Prediction: Lindgren scores in his NHL debut. "Game 47: Lottery jockeying with Chicago", 5 out of 5 based on 1 ratings. I of course don’t know, but perhaps Zuccarello has been told he is likely to stay with the team and that has resulted in his apparent renewed enthusiasm? This is the Zucc we all remember. I enjoyed watching the Rangers in their last outing as they had lots of energy. They are a team that is a lot younger then Ranger teams of the past so I expect then to be consistently inconsistent. #72 seems to gain confidence every game! he glides!!! Sweet goal by Chytil. Hank needs to reel in a bit – super agressive but some really good saves. Nice to see them respond in the 1st to their weak start. How about that lethal slap shot from Staal on the 2nd goal ?!?!?!?! Hopefully after this game Quinn stops giving DeAngelo the Del Zotto treatment. The kid has wheels and Brady is also finding his stride again. I was hoping after Fast took his second dumb penalty, coach Quinn would of moved Jesper to the fourth line and move Buch up. Not so. Which is a shame, as Buch IMHO, is ready for primetime. Congrats on the 445 but for some reason watching Roy chase the wins list it was 447 …. he lost two games after they were played?